5000728 DC Universe Super Heroes Collection is a Super Heroes DC Universe Ultrabuild Product Collection released in 2012, including 4526 Batman, 4527 The Joker and 4528 Green Lantern all in one set. This is a description taken from LEGO.com. Please do not modify it. 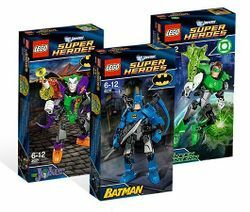 (visit this item's product page) Build and battle with 3 LEGO® DC Universe Super Heroes! Power-charge the super hero building fun with a trio of tough legends from the DC Universe brought to life with poseable LEGO® elements! Track down The Joker™ with Batman™ to disarm his venom-shooting blaster and laughing gas with Batman’s powered-up suit and swords. Then protect the whole galaxy with Green Lantern and his powered-up suit or awesome power ring with the special powers to fly, travel through space, speak alien languages and create objects of solid energy, like the morning star. Customize your models using the flexible building system! Combine The Joker with 4528 Green Lantern to make The Joker or The Green Lantern even bigger! Facts about "5000728 DC Universe Super Heroes Collection"
Build and battle with 3 LEGO® DC Universe Super Heroes! This page was last edited on 13 March 2016, at 00:53.